The Ambassador of the Kingdom of Bahrain to the United Kingdom, Shaikh Fawaz bin Mohammed Al Khalifa, congratulated His Majesty King Hamad bin Isa Al Khalifa, His Royal Highness the Prime Minister, Prince Khalifa bin Salman Al Khalifa and His Royal Highness the Crown Prince, Deputy Supreme Commander and First Deputy Premier, Prince Salman bin Hamad Al Khalifa, on the success of the parliamentary elections abroad in its first round in 2018. This success reflects the achievements of the Kingdom, under the wise leadership of His Majesty the King, thanks to his vision and reform approach, which would not have been possible without the full support and care of His Majesty the King, His Royal Highness the Prime Minister and His Royal Highness the Crown Prince. 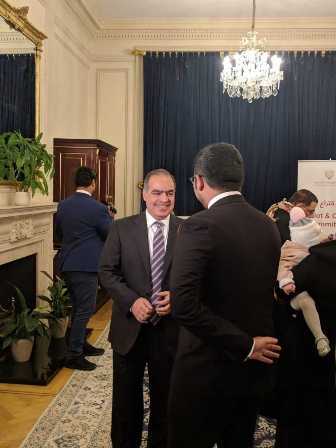 The Bahraini Ambassador highlighted the keenness of Bahraini citizens to take part in this democratic event, where a huge number of Bahrainis voted abroad, as the Polling Committee can attest to this huge success. 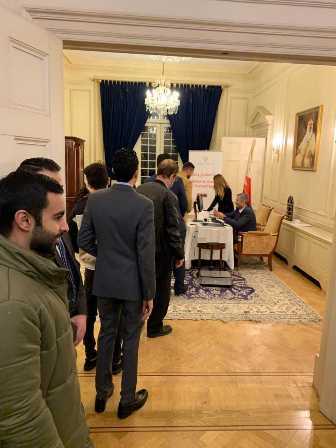 The Bahraini Ambassador affirmed the increase of voters this year, which included students, residents or visitors who came to the Embassy to vote, in the early hours of the morning, and from various cities of Britain, who responded to the Kingdom’s duty call. The Bahraini Ambassador also affirmed the Bahraini citizen’s belief in the importance of taking part in this democratic process to consolidate the principles of freedom and equality and safeguard the rights and freedoms established by His Majesty the King, as Bahrainis continued to show up right before closing the ballot boxes, which is a clear indication of the authenticity of the Bahraini people and their pride in contributing to the success and prosperity of the Kingdom. In conclusion, the Bahraini Ambassador stressed the importance of these parliamentary elections to emphasize the democratic achievement which was carried out with efficiency, integrity and transparency, and sheds light on the awareness of the Bahraini people, expressing his appreciation for the huge participation aiming to promote their national duty to serve the country and its democratic process. He also affirmed that the success of the election reflects the unity between the leadership of Bahrain and its people. 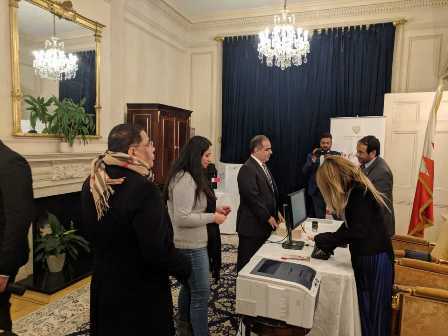 The Bahraini Ambassador congratulated and thanked the voters who participated in the parliamentary elections for the 2018 in its first round in the Embassy, commending the hard work and dedication of the Embassy's diplomatic staff to facilitate the voting process, which reflects the Kingdom of Bahrain’s positive image abroad through their service to the homeland and the citizen.